It is amazing how as we all get older the months and years seem to accelerate to point where your recollection of annual events seems to mesh together. 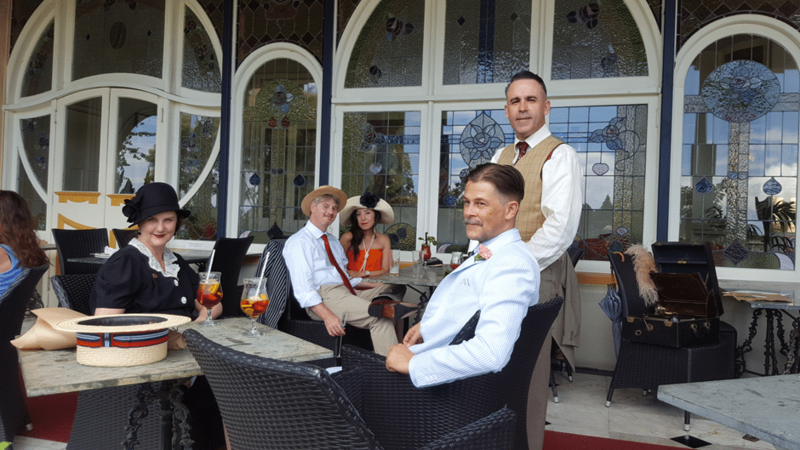 You are left with the distinct feeling that you had only attended the same event a few months before, so it was with this year’s Art Deco Ball held at The Carrington Hotel, Katoomba over the weekend of the 3rd and 4th of February. The Ball is one event, amongst others, that occur in the Blue Mountains over the month of February as part of the “Roaring ‘20s” festival. It has taken inspiration from a similarly themed festival held at the same time of year in Napier, New Zealand, which I assume many members may have visited and would be aware of its (unofficial) status as the Art Deco architecture capital of the world. 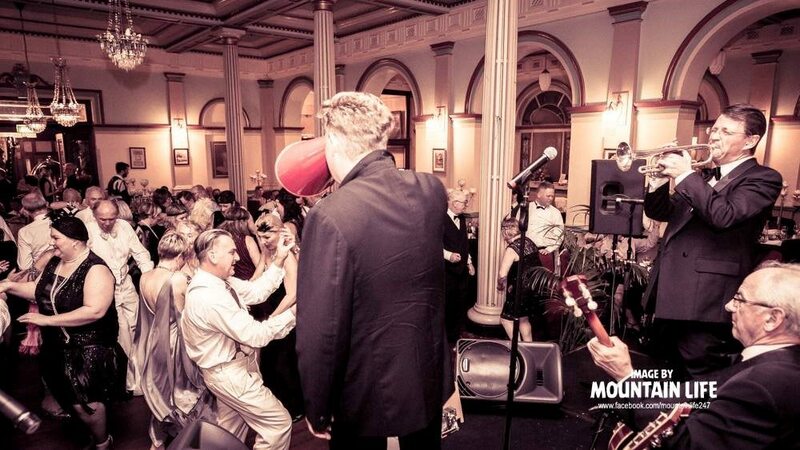 In past years the Ball has coincided with events held at the Hydro-Majestic Hotel at Medlow Bath which includes a yearly world record attempt for the number of people dancing the Charleston in period clothing. The event also attracted numbers of vintage and classic cars following which the hotel hosts a period long lunch. This year the major events have been split by several weeks presumably to allow people to attend both. My wife, Ursula, and I along with a growing number of friends have attended the Ball since 2011. It is a chance to transport yourself back to an earlier time and, for a few short days, be immersed in another world of glamourous gowns, Champagne and Whiskey, Jazz music and for me and a few others to drive into this long-departed age in style, in a word, driving a Buick. The approach of this weekend finds me pulling out the vintage leather luggage and stuffing it full of pocket watches, stiff collars, bow ties and the like. Ironing numerous shirts and matching shoes and pocket squares to suits and making sure the Buick was prepared. I couldn’t look shabby when the Buick looked so good! The thrill of anticipation I receive when I pull the dust cover from the Buick and admire its glossy blue curves never seems to diminish. Laying out our various period outfits on the rear seat and stacking the leather suitcases, wicker picnic basket and hat box in the trunk, brought to mind the images in the ’36 Buick showroom brochure. Ursula and I finally climbed aboard and backed out of the drive and into a relatively cool morning for the 120 mile trip to Katoomba. The trip was pleasant in company, many of my adventures being taken solo, and uneventful for all the right reasons with Ursula remembering to wave back at a number of classic car owners we passed along the way. The trip along on the M1 is rather tedious given that I drive to work along it most days but the slower trip gives you chance to look about a bit more and enjoy the view especially as you approach the downhill run to the Hawkesbury River. Traffic was rather light on Pennant Hills and the M2/7 motorways which are usually very congested even on weekends these days. Before we knew it we were taking the sweeping overhead ramp onto the M4 with the hazy silhouette of the Blue Mountains just off in the distance. The Buick made the climb up the hill into the Blue Mountains easily, keeping pace with the modern vehicles. Arriving in Glenbrook we pulled over to stretch our legs, re-fuel and chase down a much needed coffee. The Blue Mountains is one of our favourite weekend away locations especially during the cooler months with Ursula, Ciara and I having stayed at various historic hotels that dot the area over the last half-dozen years, ticking them off one by one. 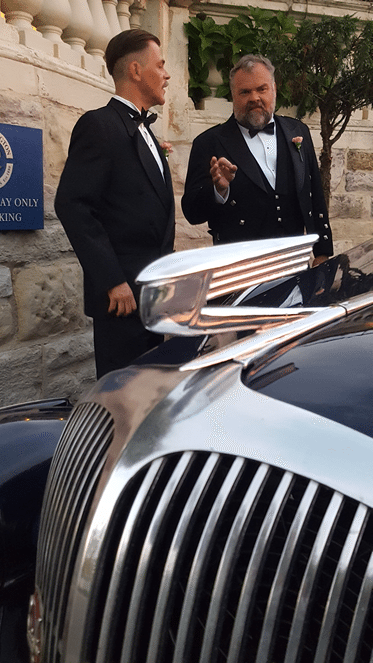 The leaf lined street, period houses and historic commercial premises provide a fabulous back drop for any period event and, it must be said, for photographs of pre-war Buicks! As we climbed further into the mountains we were enveloped in a thickish fog which also had the effect of driving the temperature down significantly. We arrived in Katoomba at about 3.00pm, after a trip of about two and half hours, which isn’t too bad considering the Buick’s comfortable cruising speed of 55 miles an hour. Driving in the hotel’s rear gate I made my way around to the front entrance. Hotel management were happy to have me avoid using the usual parking spots and to park at the front steps so as I rounding the final corner and was presented with a beautiful black ’41 Buick Sedanette already gracing the grand entry staircase. I could not recall anyone in the club owning the car but eventually came to the realisation that the one of the vehicles I had considered buying prior to settling on the purchase of my ’36. The Carrington is a beautiful hotel original built in 1882, being further modified around 1911, hence the magnificent Art Nouveau stained glass windows spanning the width of the front veranda and other similar early 20th Century modifications. It was named for Lord Carrington, who was the governor of New South Wales at the time, and has over the years, been patronised by various luminaries including the Duke and Duchess of York in 1927, the Duke going on to be crowned King George VI, father of the present Queen. It is quite a sprawling building centred on a beautiful stained glass dome. It has a number of lounges replete with leather Chesterfield chairs, pool and billiard tables, a large ball/ dining room and various styles of accommodation. My room of choice being in the Heritage Wing with shared bathrooms giving you an authentic experience but with the likelihood of a somewhat inconvenient trip to the bathroom when nature calls late at night. Having parked the Buick and disgorged its contents into our room we made directly to the elegant Art Nouveau front veranda. Here we met up with a few members of our party that also decided to make a long weekend of the event. Having ordered a delicious Gin cocktails, we sat back enjoying the vista across the town and distant hills chatting as the sun drew low over horizon. 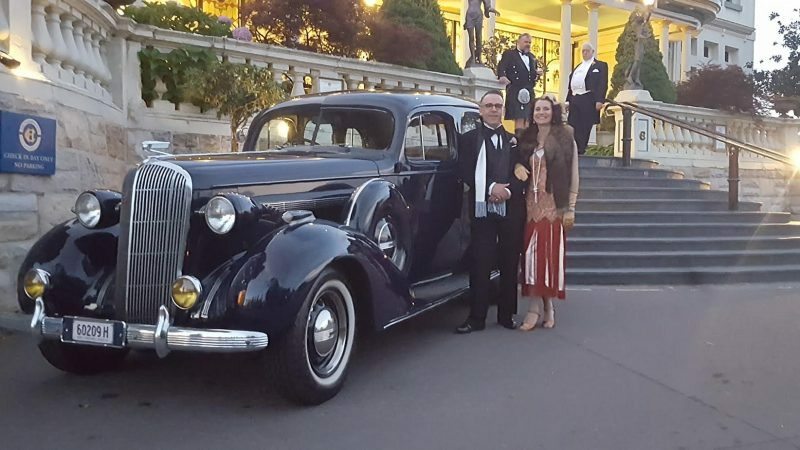 The ’41 Buick re-appeared and the owners also took the opportunity to have a few pre-dinner drinks on the veranda. Grabbing a Buick Club flyer, I went over and introduced myself to Michael and his partner Fiona, espousing the benefits of club membership. Later on our group retired to enjoy a relaxing dinner in the sumptuous ball room. On Saturday, after a cooked breakfast, the girls decided that a trip to the shopping Mecca of Leura was in order. The village lays just off the Great Western Highway via a short, undulating trip through tree shaded streets from Katoomba. An offer to take passengers was hastily accepted and with a Buick full to the brim with ladies in hats and furs off we trundled. Leura is a somewhat touristy town but pleasantly picturesque all the same. The ladies managed to spend enough on vintage dresses, furs and jewellery to keep the local economy afloat for the next few months at least. Afterward, we all retired to Bon Ton café’s tree shaded garden for coffee and a chat. As the ladies had picked the shops of Leura clean we climbed back in the Buick and took the scenic route back to Katoomba via the Three Sisters passing by a number of notable Art Deco houses. Back at the Hotel we found the rest of our party had arrived and were sitting on the veranda drinking cocktails and winding up my friend’s Gramophone for some afternoon entertainment. The remainder of the day was spent relaxing and catching up with friends over cocktails whilst watching the Ball attendees arriving in their Flapper dresses and Fedoras, many of them stopping in front of the Buick for a photo. 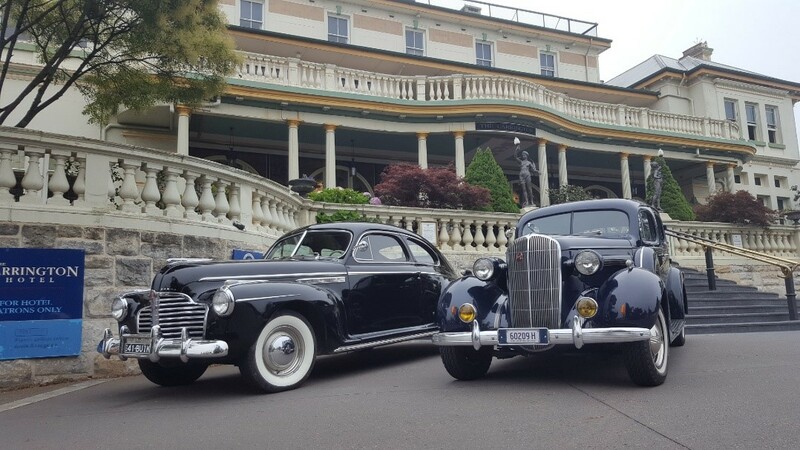 I also had the opportunity to take a few other friends on sightseeing trips around Katoomba and Leura in the Buick much to their delight. The ladies disappeared at about 4.00pm to conduct their “secret woman’s business” which, as far as I could tell when I answered a fevered telephone call requesting the delivery of another bottle of red to the ready room, consisted of helping each other to curl hair and apply make-up. The men took the opportunity to remain in the lounge drinking and chatting as is the only right and proper thing to do in such circumstances! Later on the men too retired to wrestle with bow ties and detachable collars before we all re-convened in the dining room for dinner at 7.00pm. The ballroom looked magnificent and was awash with glittering ‘20s and ‘30s dresses and the obligatory black and white tie for the men. Entertainment was provided by the Greg Poppleton and his Bakelite Orchestra who played pre-war style jazz. Ursula and I attempted some dancing but a sore leg found me a poor partner to Ursula exuberant efforts. Dinner included three course with wine, beer and champagne included. It proved to be a very warm evening so regular trips out to the veranda were taken. After the dinner was finished and the band had packed up many of us made their way out on the veranda carousing into the early hours of the morning followed by the mercifully short trip up the stairs to bed! The Sunday dawned ominously warmer than it had been, after a final breakfast together in the ball room, we set off to have a final look at a few shops in Katoomba and then drove over to the Everglades Gardens. The property is owned by the National Trust of Australia and was created by designer Paul Sorensen in the 1930’s. The gardens are beautiful with gravel paths, wide lush lawns and terraced gardens. Tea and scones, amongst other treats are available in the house at very reasonable rates. I think it would make a great location for a Buick picnic if the Trust would agreeable to let us drive into the property, down the gravel driveway and park on the edge of one of the lower lawns adjacent to the house. After morning tea, it was time for us all to head off home. The mountain weather was still relatively cool for the time of year but as we descended down the mountain the heat increase considerably. We were caught in a traffic jam behind a multi-car collision. Waiting in the traffic with the engine and cabin heat rising we must have looked rather hot as a couple in a neighbouring car starting chatting to us. They jokingly attempted to wave some of their air-conditioned air in our direction! Eventually, we were able to use some back streets to circumvent the accident and continue our journey. Reaching Penrith on the M4 the temperature was about 45c so we dropped the speed back to about 45 miles an hour as a precaution. Pulling onto Pennant Hills Road, the engine was running a little too hot for my liking so we pulled over to let her cool off and bought a 24 pack of cold water and an ice-block each. Carrying on along the M1 home we pulled over again just south of the Mooney Mooney Bridge to cool off in anticipation of the steep climb on the north side. Here we found an unfortunate lady and her teenage daughter stranded with a burst radiator, they had been waiting for an NRMA tow for about three hours. After a bit of a chat we set off again, leaving them with some cold water, and completed the final leg of the journey. It was a great weekend and made all the better by having the Buick as a focal point. It also appears I was successful in convincing Michael and Fiona to join the club and I hope to see them and their ’41 Sedanette at future events.